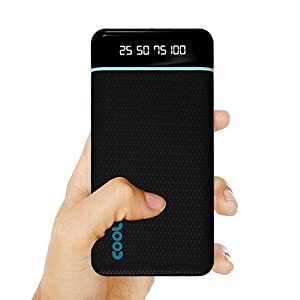 Amazon's Choice for "battery backup"
Sold by Coolnut® (4.6 out of 5 | 426 ratings) and Fulfilled by Amazon. Gift-wrap available. 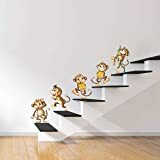 Sold by Coolnut® and ships from Amazon Fulfillment. In this advanced world, everyone owns and uses high-end gadgets. And in your these exclusive collections of gadgets nowadays emerges to be the name of a must keep power bank. 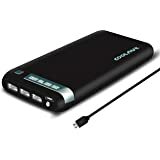 But its commonly seen, the major problem we come across using an ordinary power bank is its slow charging speed to our mobile and its slow speed of recharging itself. So, to change your dissatisfaction and long time taking charging practice into a super fast charging experience we are providing you with the best, high-performance and premium quality Dual USB output Coolnut 20000mAh Power Bank with 4 Digital LED Indicators. 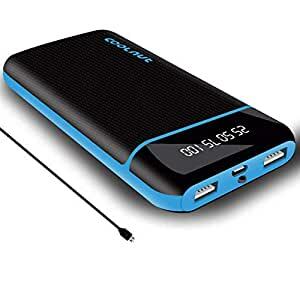 With high-speed charging technology, this amazing power bank rapidly charges your smart phone and other high-tech gadgets with a maximum of 2.1A output. It quickly puts life back into all your devices, whether indoors or outdoors. Made with the best premium quality ABS+PC material with elegant and brilliant looks, it shell case offers great strength for long. 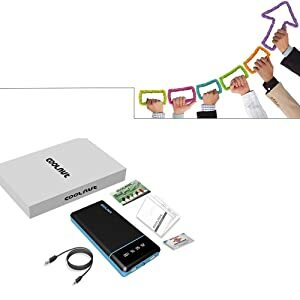 Its unique feature that enhances its class is the beautiful looking Digital LED display to show remaining charge level.Compared to other cheap quality models that fail to serve high-output charge, this innovative and integrated power bank comes with Original Li-ion cells that serve very powerful charge. 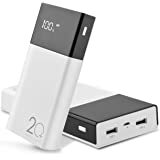 Moreover, to completely safeguard your charging devices, the power bank is incorporated with IC protection and 7 layer multilevel charging-discharging mechanism. 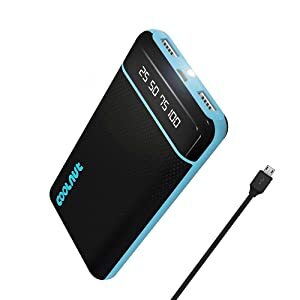 This massive capacity power bank is known for its quality and performance. The 20000 mAh power beast allows users to charge almost all the devices. In this advanced world, everyone owns and uses high-end gadgets. The major problem we come across using a standard power bank is slow charging speed and slow speed of recharging itself. We are providing you with the best, high-performance, fast charging and premium quality Dual USB output with Coolnut 20000 mAh Power Bank. 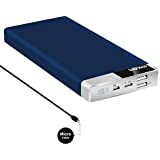 With high-speed charging technology, this amazing power bank rapidly charges your smart phone and other high-tech gadgets with a maximum of 2.1A output. It is compatible for all types of smart phones, tablets, bluetooth headsets, bluetooth speakers, pdf, etc. Its silicon shell case quality finished on durable ABS+PC offers great elegance providing an anti-slip and perfect grip feel always. 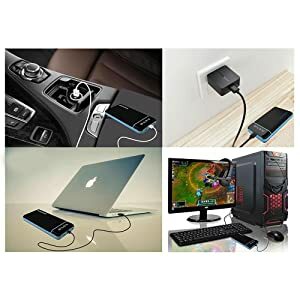 It can be recharged fom the laptop, car, adapter, etc. It is protected from over charge, over discharge, over current, over heating, over voltage, and has auto power off feature. 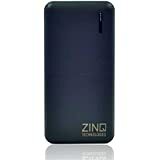 This amazing power bank rapidly charges your smart phone and other high-tech gadgets with a maximum of 2.1A output. It quickly puts life back into all your devices, whether indoors or outdoors. 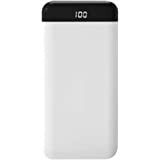 The power bank features a digital LED display to show the remaining charge level. It also includes an LED flashlight that lets you stay illuminated during emergencies. Huge 20000 mAh capacity to charge your devices multiple times. Faster(input): Advanced 2A fast recharging input technology. 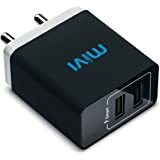 Faster(output): Super fast charging with 2.1A USB output port. Modern design: Classy look, premium finish with long-lasting performance. 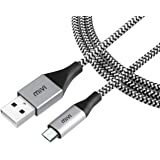 Quality accessories: Durable last long cable. Smarter: Intelligent PCBs circuits mechanism. Made in India: Excellent quality made in India product. 1.0 out of 5 starsStopped working after only a month. One year warranty is fake. Amazon isnot helping either. Would not recommend it at all. 3 times the cost and has stopped working after a month of buying. A terrible power bank. It stopped working on exactly the 32nd day, its like they planned it. Thugs! 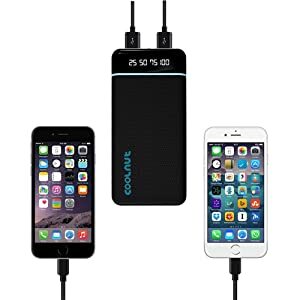 My review is for two products together (1) COOLNUT CMPBAND-53 20000mAh and (2) FNS COOLNUT 20000mAh. I had bought them together; I am using one of them and my son uses the other – both the models change hands from time to time between the two of us. All the accessories (of both the models) have been mixed up; hence difficult to describe them separately. One came with a charger and other didn’t have one. But both the models are giving a superb performance. Design – attractive, compact, handy; has a good grip. Performance – as described. Charging is quite fast. It has auto off mechanism when your mobile battery is fully charged, or when you disconnect the load (mobile). Haven’t checked the exact capacity, but I can charge my moto g 5 several times. Customer service – can’t comment now. Haven’t had the reason to contact customer service; hoping that I don’t have to. Verdict – a dependable compact power house. Go for it. If at all looking for a con in this, then I think the weight is bit heavy (not much but yeah little which is manageable ). Almost 6 months of use and the battery capacity has somehow reduced. I have a note 8 which has a 3300 mah battery. I can charge my note 8 0-100% only twice. The power bank just dies after that. Avoid buying. There are better options there. Also it charges very slowly. So keep that in mind. Awsome product battery backup is very good and longer duration if u want to purchase then just go fr it, but onething abt display its very bad... i gave 5 star only for battery backup... and i ll nt give too much of importance to display..
4.0 out of 5 starsGood product, I recommend it. Read the tips though. 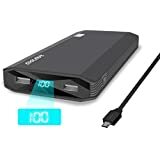 This is one of the best power bank I came across. And I have experience with various brands. It could recharge my Coolpad Cool 1 (4000mAh ) nearly 3 times and the fast charging 2.1 A port works too. The light is bright enough for a small camping trip and bright white. Which came in handy for me numerous times. The only problem is the way they have provided the on/off switch which accidentally gets turned on even for a minute pressure, which means if you put the powerbank in a tight bag, it will play the on/off game. It takes around 7-8 hours for getting fully charged and the 4 blue LED indicators blinks to let you know the status of charging. Which is also a good night lamp. 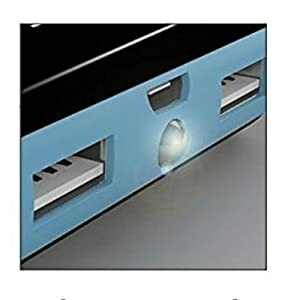 One hack I found is that you can purchase a USB LED laptop light and plug-in to get a nice emergency lamp too. Overall I recommend the product. I personally believe this product is better than the Ambrane, Intex, Mi and Huawei power banks. Update : Jan 2019, Still works without any problem. 1.0 out of 5 starsJust stopped working in 2 months..
Got this in March .. was using it for 2 months ..
One day it just went dead .. not getting charged .. no indication of a functional piece.. 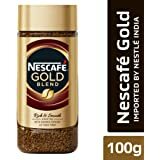 When I had purchased it , got a few calls from coolnut guys to post a review.. Thought, should use it for a while before posting one.. Since I had purchased it after reading such good reviews about it, was really not expecting that one day within just 2 months, for no apparent reason it would just conk off.. Hoping the team at coolnut would help sort this out .. Giving 1 star as it was working fine as long as it did.. N Amazon wont allow me to post this review without rating it..